Deutsche Bank, one of the most active commercial lenders in New York City, might get even bigger. 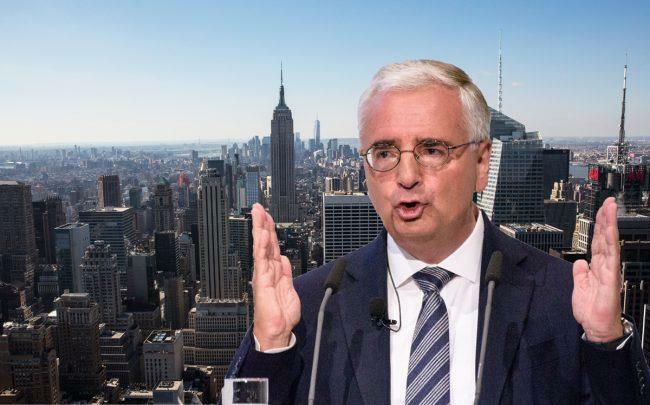 Paul Achleitner, the German bank’s chair, is considering merging the financial giant with Commerzbank, according to Bloomberg. The executive has reportedly spoken with top bank shareholders and German government officials about the matter, but there have been no formal talks about the process yet. However, mergers have been discussed before to help ensure Germany has a financial institution that can match up with its sizable economy. Deutsche Bank has had a rough 2018 so far, with shares down 40 percent and hitting a record low last week. Its market value is at 19.6 billion euros. Commerzbank, which has also had a rough year and is down 1.5 percent, is valued at 11.7 billion euros. The question of a merger has largely come from investors as Deutsche Bank looks to break out of a circle where its turnaround plans fail to deliver enough revenue to justify expenses, leading to credit rating downgrades and increasing funding costs. However, investors are wary of an immediate merger given Deutsche Bank’s low share price. Deutsche Bank is the most prolific commercial lender in New York, originating $6.17 billion worth of non-construction loans between October 2016 and September 2017, according a ranking by The Real Deal. It also topped the list for construction lenders in the city, with $2.67 billion in deals over the same time period. The lending giant has had it’s fair share of issues in the U.S. In December 2016, it agreed to a $7.2 billion settlement over its role in the subprime mortgage crisis. Roy Smith, emeritus professor of management practice at New York University’s Stern School of Business, told Bloomberg he remained skeptical that a merger would work.